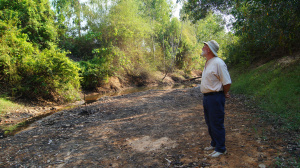 The day of our expedition to Don Jik, a forest close to Phana City, was set on the Thursday of the 7th March. That is to say, the expedition was designed to track a ‘lost’ monkey group that locals reported having seen at the bridge of Don Jik. I remember Tony to be excused from the expedition due to a football match the same evening; Bekah didn’t feel well. 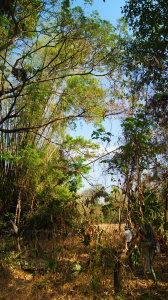 So there were only three of us – Liz, Lawrence and I – who made the way in hope of finding monkeys at Don Jik. 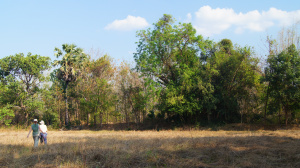 By the time we arrived at the small piece of forest, it was afternoon and the scorching heat lay all over the forest. No monkey could be seen or heard. Luckily, we started the expedition in the dried-out river bed, so it was cool enough to fight the heat. At the outset, the way up the river was clear and accessible. All eyes were on the trees in hope to spot a monkey. But all we found were some swimming bugs as well as various butterflies and dragonflies. 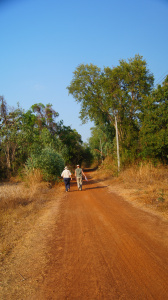 When we reached the next road, Lawrence decided to guide us through the dense undergrowth. It was a hard piece of work to get through it not snagging our clothes on the countless branches. For almost two hours we were wandering around, but all effort was fruitless. In the late afternoon, when the sun was about to set, we set off for home. Because we hadn’t found any evidence of a monkey-like trace, none of us could believe our ears that only one day later Lawrence came up with the news that two monkeys, probably of the wanted monkey troop, had been seen again by the bridge of Don Jik. We never had an expedition to Don Jik again, but time will tell whether another one is needed or not.